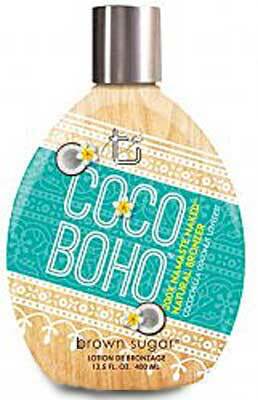 COCO BOHO Natural Bronzer by Brown Sugar -13.5 oz. Home/Tanning Bed Lotion /Tan Inc. Brown Sugar/COCO BOHO Natural Bronzer by Brown Sugar -13.5 oz. Join the movement it’s about a way of life that makes the most out of the hereandnow. Whether you are traveling the world or dancing to the sounds of the next up & coming band, make sure you look the part. This 200X Natural Bronzer caresses skin with ultradark tanning ingredients free of gluten, paraben, & sulfates. So you can live carefree knowing we love your skin as much as you do. It’s all about the little things, that’s why we also added a splash of coconut milk to caress skin for a beautiful bohemian glow, leaving you ready for the next adventure.